One of the best ways to calm fussy babies is by giving them a pacifier. However, as babies grow this can be a difficult habit to break. The use of pacifiers can cause improper mouth development which leads to abnormal tooth growth and additional complications later in life. Here’s what you need to know about the impact pacifiers have on your baby’s smile. Physical development is crucial for children’s overall health in the first few years of their life. What you do now can affect them for their entire life. Pacifiers can influence the shape and alignment of your child’s teeth and jaw. It can move the front teeth forward and you may notice your child developing crooked teeth or bite problems. The front teeth may also not meet when their mouth is closed and there can be changes in the shape of the roof of their mouth. While they may contribute to oral health complications, pacifiers do offer several benefits for parents and children. According to the American Academy of Pediatrics (AAP) babies up to one year of age who are offered a pacifier at night have a reduced risk of sudden infant death syndrome (SIDS). Since pacifiers can be beneficial for other health reasons, you should speak with us about how to wean your baby off of pacifiers. We also recommend that you visit our office for an examination as soon as your child’s first tooth develops. 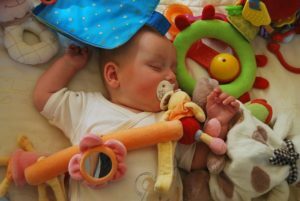 Breaking the habit of pacifier use can be difficult, but there are various ways you can wean your child off a pacifier. By following our tips and recommendations, your child can experience the calming effect of pacifiers without developing pacifier teeth. Call and schedule your child’s next appointment with our team today.